Do you think about switching to a vegan diet? Look out for vitamin B12! Vitamin B12 has a number of important functions in the body, the most important of which participation in the process of blood formation, affects the proper functioning of the nervous system, participation in the removal of homocysteine (called cholesterol of the 21st century) is strongly associated with cardiovascular diseases. Vitamin B12 deficiency develops slowly, because the human body has the ability to store a large amount of it in the liver. In some cases, the stored vitamin B12 is enough to cover human needs even for several years. Unfortunately, what amount of vitamin is accumulated in the liver depends on individual characteristics. In practice, there may be a shortage even after a few months of transition to veganism. Vitamin B12 deficiency manifests itself in a non-characteristic way. In extreme cases, there is a disturbance of consciousness, weakness of muscle strength, memory loss. These symptoms are associated with changes in the nervous system. The best way to check if a B12 deficiency has developed is to determine the total vitamin B12 in the blood serum. If you are on a vegan diet, do this test regularly, at least once a year! Vitamin B12 is found only in animal products (milk, eggs, meat). On a vegan diet it is necessary to supplement it from the very beginning. Many studies indicate that also on a vegetarian diet, where there are eggs and dairy products in the menu, there is insufficient intake of this vitamin. or 1000 mcg (microgram) 2 times a week. In case of strong deficiencies, injections with vitamin B12 are introduced. Before you start supplementing, choose the right dose after consulting your doctor or dietitian. Supplementation of supplementation may be included in the vegan menu of products to which vitamin B12 was added at the production stage. They are so-called enriched products. Remember that these products should not be the only source of vitamin B12. To maintain its proper amount in the body, supplementation is needed, but in addition, plan 1-2 food meals enriched in your daily diet. 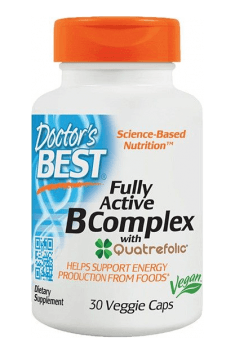 You can read also: The best B complex on the market!